Created by Olle Cornéer and Martin Lübcke. Programming by Jens Berlips, Fredrik Andersson and Arne Wallander. 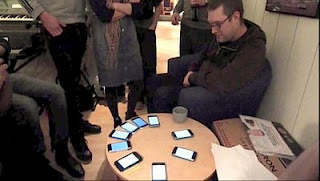 Bacterial Orchestra is based on the concept of gathering half a dozen friends with iPhones and using software to make the phones create loops of music. A huge musical organism that is not only self-organizing, but also evolving with the sound environment. Exactly what roll human activity is playing in this gathering is unclear except for an isolated human sound sample, minimalist behavior looks to be the key. Nevertheless to get the most from this new "viral" video, turn your volume up . "Every device works as an audio cell: listening and picking out sounds, then playing them back to create music This means trying to play in rhytym with what it hears, but also listening for phrases and melodies to complete. The one's that are fit enough musically survives. The other die and are reborn with new parameters - a new set of DNA The result is a self-organizing musical organism, constantly changing amd evolving together with the audience and the sound environment The cells only communicate through audio. The installation can be scaled to an unlimited number of devices." This rhizome of collective collaboration conveys a historical association with Frippertronics, Loop Guru and more recently mass cell ringtone events.